The eWave tablet has gone through several iterations, evolving from an awareness-based display to an active power saving home control device. eWave is an energy display which goal is to raise awareness on the amount of energy spent in a household, given in kWh, currency and CO2 emissions. The original eWave display was a passive display that only displayed the consumption of the main meter, but the latest version of the device can also actively control user-selected devices in a home to reduce unnecessary consumption. eWave is a product of the Sandefjord based company eWave Solutions, previously known as Miljøvakt. Ewave started its life as an idea by entrepreneur and founder gunnar skalberg. Norway is currently among the top ten in the world when it comes to energy consumption per capita. The main reason for this is the cold weather, and the relatively cheap power prices. The main source of the power consumption in norway is arguably heating of houses and water, and lighting. Households have been reported to be responsible for almost half of the co2 emissions in the world, and ewave solutions’ goal is to reduce this significantly. The ewave tablet started out as a touch display, targeted at a scientific test project. The decision to go against the mainstream app-based energy displays combined with a gateway was a conscious choice. Previous studies conducted in the uk concluded that a physical device greatly increases awareness compared with a more abstract application on a smartphone. Since the main instrument for energy reduction in the original ewave was increased awareness of the issue, a concrete and visible tablet-based display would prove important. However, the ewave tablet has gone through several iterations, evolving from an awareness-based display to an active power saving home control device. The latest version of the ewave tablet is currently capable of controlling switches wirelessly, and reading temperatures from wireless thermometers. It is also possible to use the ewave display to keep track of power consumption on several circuits, which makes the device perfect for tracking how much energy one single oven is using over time, with associated costs in both currency and co2 emissions. Ewave can also display the current consumption of any circuit with a high refresh rate. This feature gives the user instant feedback when they turn on or off an electric device. 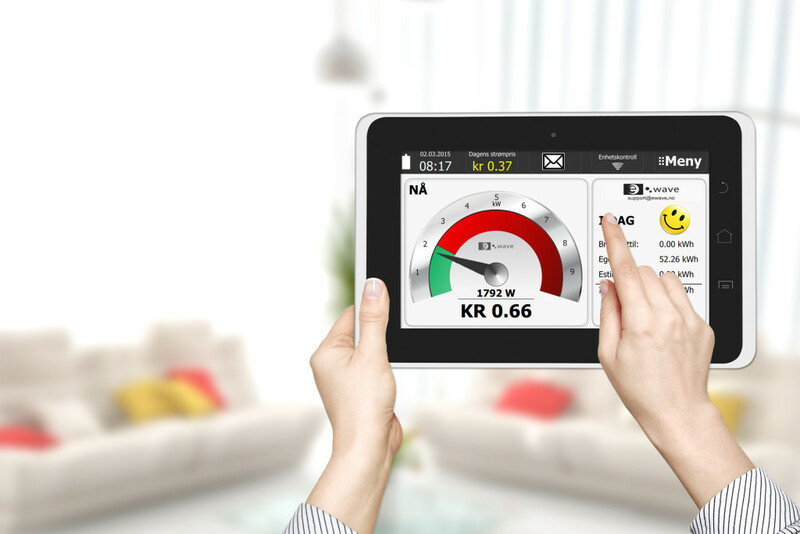 The ewave tablet includes many features targeted at reducing energy consumption, including regular savings tips and overview of the current and historical power price from the energy providers. The tablet can also keep track of the household consumption. A savings account application is available in the tablet, which lets the user set up a saving goal per day, and keeps track of how much money the user saves over time. The user also sets up a yearly saving goal, which the tablet uses for feedback and status reports every day. Furthermore, ewave solutions and data respons is currently working on extending the ewave functionality further into the world of home automation with more smart control of household power consumption. In early 2014, ewave partook in a research project in hvaler organized by smart energi hvaler. The goal of the project was to test out new energy reducing technology and see the effects it had on the consumers. Ewave proved to be one of the most influential devices participating in the project, resulting in a general consumption reduction of up to 20%. Some users were also able to use the ewave tablet to find electrical faults that increased energy consumption in their homes. The tablet used for the ewave project is a custom android based tablet running on a dual core arm cortex-a9 cpu. The ewave application was developed using qt for android, which was in the early stages when the project started. Qt was chosen to ensure platform interoperability if another os is chosen at a later stage. Using qt with minimal android support was somewhat of a gamble, but as the support grew better, the gamble paid off significantly. Qt is now supporting linux, android, ios, osx, windows, winrt, blackberry, sailfish os and more, which makes the ewave application highly portable. For wireless applications, the ewave devices supports both z-wave and zigbee. The z-wave api is currently only targeted at energy readings. For zigbee, the tablet supports clusters for switches, thermometers, energy readings and a few others, but more clusters will be supported when needed. The tablet sets itself up as a zigbee network coordinator, and automatically binds to all previously known devices that are nearby. This simplifies the user experience and makes the ewave easier to use. All energy consumption data is stored both locally on the tablet, but also synchronized to a server maintained by ewave solutions. This way, all historical data is safely stored and available if a device needs to be replaced. Having the consumption data stored on a remote server also enables large scale observation of consumer energy consumption habits. This data can be used as an indication for future improvements in the power infrastructure, which can be a major asset for the power company. The consumption data can also be used for research and commercial purposes. Data respons has been responsible for the development of the application since december 2012, and is currently working closely with ewave solutions’ cto on the home automation extensions for the product. The ewave project has been an important project for the r&d department in asker over the past two years, with innovative development and exciting new technology. With the increasing focus on reduced energy consumption and co2 emissions, the ewave product projects a brighter future that r&d services is proud to be a part of.